This is one of the first popular card crafting games. Similar to dice crafting games, where you change faces of your dice to make them better. 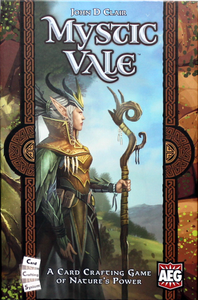 First of all, i have only played a digital version of Mystic Vale on Yucata, but i feel that physical aspect of dealing with sleeves and sliding upgrades in (and out at the end of the game) would annoy me. So because of that i would rank it lower. But is it worth it dealing with sleeves. This game lacks excitement. Maybe new game with this mechanisms that AEG plans to make will have more things to do. In this one you essentially get mana, buy upgrades to get more mana, get more mana and buy more upgrades to get more mana. Some upgrades have points printed on them. There are also special symbols, which allow you to buy special cards, but in general they just give more points and i was able to do well not even paying attention to what special symbols i already have. So, it feels repetitive and a bit dull. Long build up only adds to that feeling. For a good chunk of a game you can’t do anything special. You get a few drops of mana and can only buy a regular or very cheap upgrade and this repeats on and on. After a while you accumulate a bit more mana and more interesting choices can be made. But it takes a while. There is an option to push your luck and try to get more mana on your turn risking to burn your turn. And it is not worth it. I tried this strategy a few times and it failed. There are just too many corruption icons on your cards in the beginning. So you are better to just slowly build up (it feels like the game could be better if you would get better cards with more mana in your starting hand). You can even burn automatically without pushing your luck! It is in the game mechanisms and it happened to me a few times. This is just dumb. All in all, there are some unique aspects to this game and in general it feels like deck building game and i like this genre. But the gameplay is dull, repetitive, with a too slow build up and random burning mechanism. Also physical aspect would drive me away. So, only 6/10.